A popular Portadown man laid to rest on Thursday was the “heart and soul of many people’s everyday lives,” a minister has said. Trevor Black died in a traffic collison on the coast road near Larne on Sunday, when his motorcycle collided with a black Jeep at around 11am. Trevor, also known as Blackie and Tommy, was a popular, hard-working man who had a passion for motorcycling since his youth. 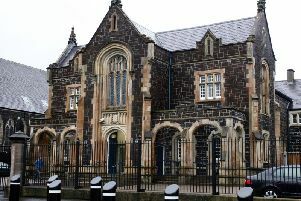 A funeral service was held on Thursday at 2pm in St Mark’s Parish Church, Portadown, with committal following in Kernan Cemetery. The funeral was conducted by the Reverend William Orr. Mourners heard that Trevor and Lynn Black had been together for 38 years - 24 of them spent as husband and wife, Rev Orr passed on his sympathies to Lynn and the couple’s daughter, Kerry. The congregation heard how Trevor had found joy in purchasing his daughter her first car at the end of September last year. “He had to wait, hiding it in Brian Hart’s garage until December before he could surprise her with it,” Rev Orr added. The clergyman went on to say that Kerry would forever cherish the memories she has of her father when she was young. Trevor’s passion for motorcycles was highlighted by the clergyman, describing how he had gained many friends from it and enjoyed regular Sunday morning journeys, whilst his friends at the North West would miss him. Mourners who gathered heard how Trevor had a “strong work ethic” and he was the man who “would sort it out” should any problem arise around the house. They were treated to stories and anecdotes about family life, including being called to fix some burst pipes in the middle of Christmas dinner. Rev Orr told of how Trevor would be missed dearly inclduing by his Uncle Tommy, who said “he was like a son” to him. Reverend Orr offered thanks on behalf of the family to a number of people including Bill Orr who held Mr Black as he passed away following the crash.